The media – whether print or digital – are experts at what they do. They know what articles make people react. They know what motivates people to buy their newspapers and watch their news programs. They know how to drive tweets and retweets. I therefore observe and review how they craft their craft; how they shape the stories they sell. Photographs – even in papers that art the printed word – are the most engaging. They are no longer limited to tiny and grainy black & whites of decades ago; they are now displayed in vivid colors that convey a story and an emotion. The choice of which pictures to present, as well as the how and where, essentially prioritizes the news for the reader. For example, a color photograph on the top of the front page with an associated article in the far right column is the most news-worthy story of the day. If a photograph is small and in black & white in the back of the paper, alongside advertisements and other news stories, it would transmit the passing interest in the event. With such understanding, I reviewed the New York Times coverage of the kidnapping and killing of three Israeli teenagers, and the killing of Arab children in the subsequent days. 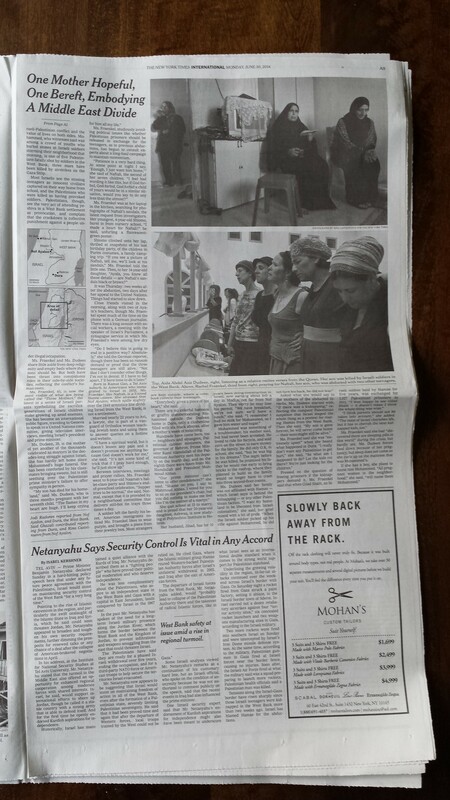 On June 30, the NYT ran a cover story on the bottom of the page, including two color photographs, about two mothers of victims – one Arab woman from the West Bank and another Jewish woman. The caption stated that the Arab woman’s son was “killed by Israeli soldiers” (one would need to read the article to learn that he was pelting the soldiers with rocks and bricks). The caption added that the Jewish woman’s son was “missing”. The article continued on page A9, with black and white pictures of equal size showing each woman together with friends praying. The captions again repeated that the Arab boy “was killed by Israeli soldiers”, and that the Jewish boy “was abducted” with other boys. 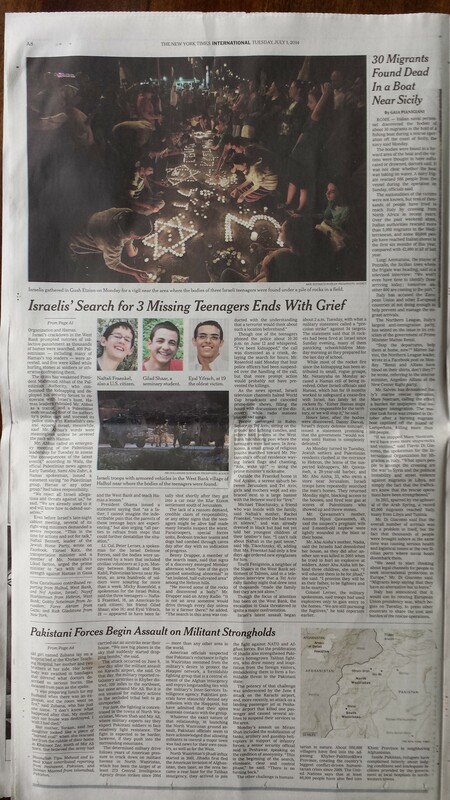 On July 1, the NYT ran a cover story that the Israeli teens were found dead. The story ran on the left hand (secondary) column of the front page and had no picture. The paper did, however, include several color photographs in the middle of the paper, on page A8, of a prayer vigil, pictures of the three boys, and army jeeps near the discovery site of the boys. The caption reads that their bodies “were found”. 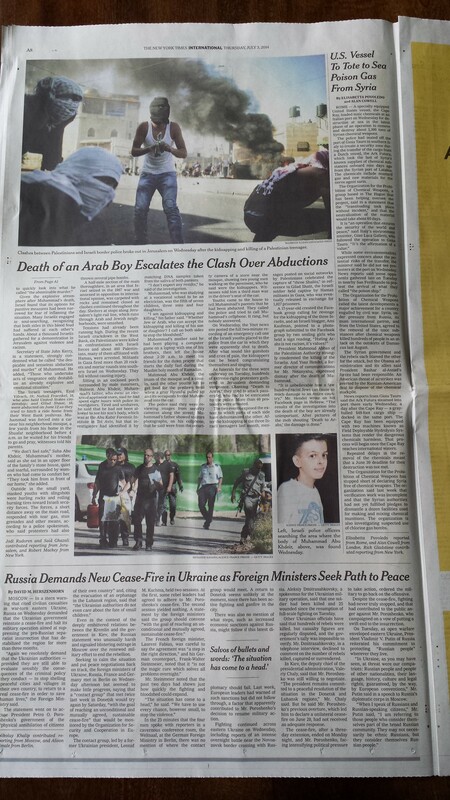 On July 2, the NYT did not have any cover stories about the killings of the Israeli boys. On page A4, it posted some black and white photographs of friends mourning at the gravesite of one of the murdered teenagers. The caption read that the boys were “found dead”. The associated article ran from page A4 and continued on page A20. 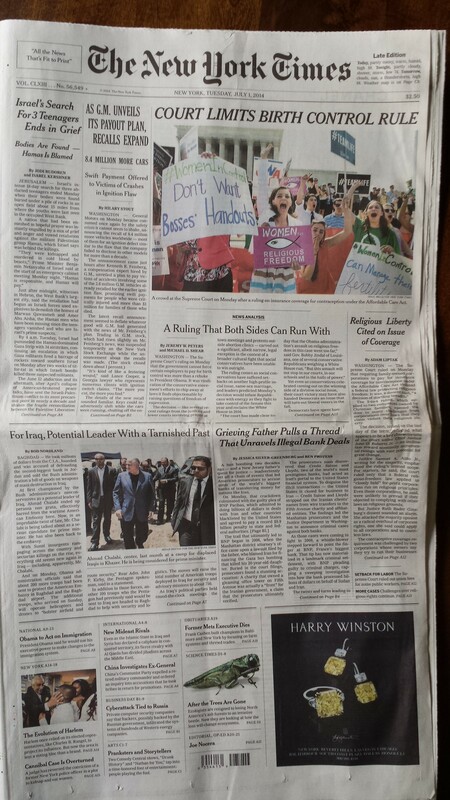 On July 3, the NYT posted a large color photograph on the top of the page of Arab women mourning and an associated right-hand column about the killing of an Arab boy (the trifecta – large color photo on top of page 1 and associated right-hand article). The caption said her “son Mohammed was found dead” included a quote from the mother of the dead boy “We don’t feel safe”. 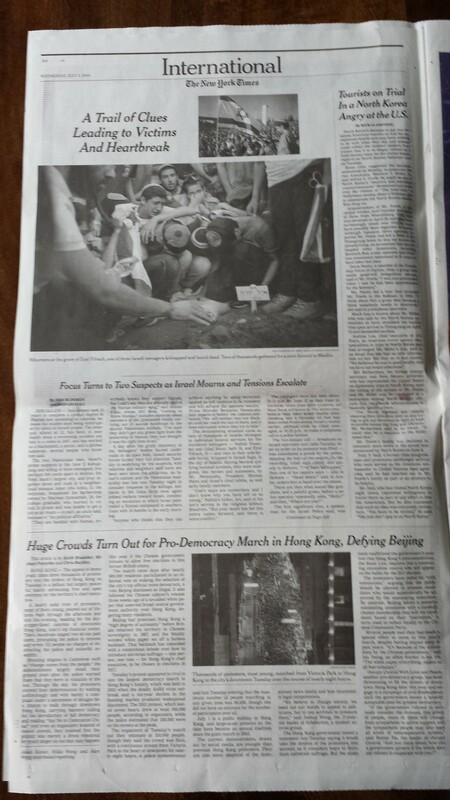 The cover article continued on page A8 with three additional color photographs of: Palestinian men clashing with Israeli police; Israeli police searching the crime scene; and the dead boy. The captions state that there was a “kidnapping and killing of a Palestinian teenager”. Over these four days, if one were to just get news from pictures and their captions, what would a reader take away? From the captions, it would appear that everything that happened to the three Jewish teenagers was passive. The boys were “missing” and their bodies “were found”. There was no mention of kidnapping or killing, nor any attribution of who was the aggressor. Contrast that to the captions of the Arab boys who were “killed by Israeli soldiers” and another that stated there was a “kidnapping and killing of a Palestinian teenager”. The aggression described against the Arab victims was underscored by the cover article quote from an Arab woman that “We don’t feel safe”. Pictures and captions showed Israeli soldiers and police, but shared no sentiment of the Jewish women. 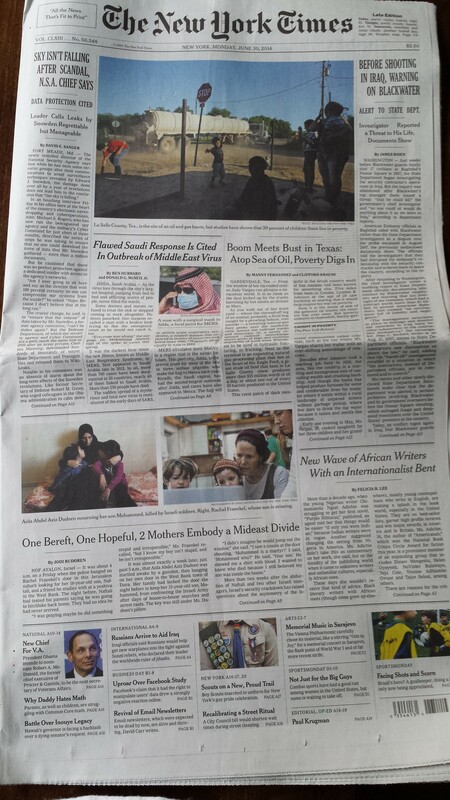 Further, the large color pictures on the top of the page with the Arab women mourning was the only time that the NYT gave the stories in the region prominence. The only time we saw a cover picture (on the bottom of page) related to the Jewish victims was when one of the mothers appeared alongside a grieving Arab woman in a story meant to convey balance in grief. In fact, the underlying message was not balance: the pictures and captions made clear that the Arab woman was a victim of Israeli aggression trying to find missing teens, while the Jewish woman still had hope that her “missing” son (not kidnapped) would reappear. 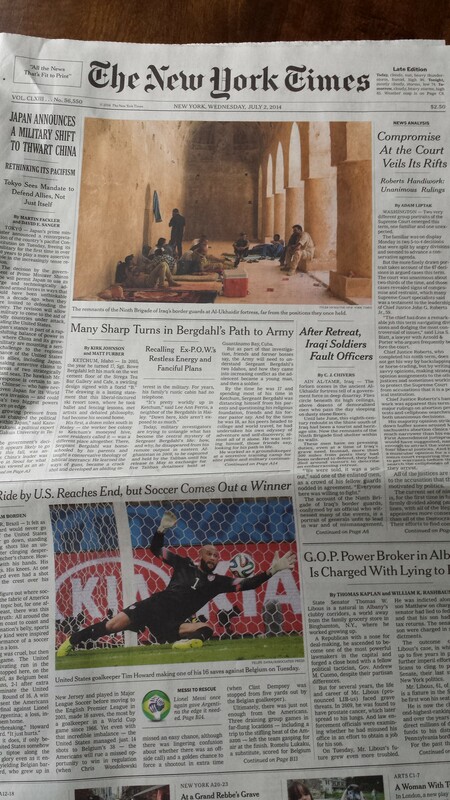 What does the NYT positioning of greater emphasis on Arab suffering convey to a reader? How do the pictures of Israeli soldiers in armored vehicles and border police with machine guns compare with Palestinians throwing rocks? Were the pictures and captions deliberately shaping a larger story than the immediate events? Were people more likely to buy the paper or talk about it with friends? Does the Times believe that more readers sympathize with Arabs than Israelis? Does the NYT editorial board believe that Israelis are the aggressors and Palestinians the victims, even when this entire episode began with the abduction and murder of three Jewish teenagers on their way home from school? This entry was posted in Middle East Analysis, New York Times and tagged abduction, Eyal Gilad Naftali, Israel, teens murdered by First.One.Through. Bookmark the permalink. It is clear, and has been for many years, that the coverage and the way the story is told about this conflict shows a significant anti-Israel and very definite pro-Palestinian bias. It is no wonder that those who truly do not know both sides of the conflict can over sympathize with the Palestinians as victims of Israeli aggression and occupation. It is also evident when rockets fly from Gaza and Israel responds…..how often do you have to try to find out in an article that the “disproportionate” air raids were in response to missiles were “lobbed” into Israel from the Gaza enclave under siege. Most recently, after the 3 boys were found dead and Israel hit Gaza by hitting over 30 targets in one night the article made you look really hard to see that there had been missiles that landed without injury into southern Israel. What you don’t see is that since the boys were kidnapped (not nearly 3 weeks later when they were found) almost 50 rockets were fired into Gaza with the intention of killing as many Israelis as possible (no, you won’t read the intent, only that missiles were merely lobbed into Israel — so casually as to make you think that it is harmless). Shameful. Jerusalem Bureau Chief Jodi Rudoren’s “rabbi” is notorious for Israel-bashing, as is Rudoren.. Any decent, objective newspaper would have fired the viciously anti-Israell Rudoren long ago. I’m all for a free press, but Israel; is struggling for its very existence. The NY Times, The Guardian and Haaretz should all be removed from Israel. I live there for a year and my daughter for 2 years. The newspapers are creating a very anti Israel feeling out there in the world….the are for sure anti-Semites…. This story was really well-done, with the text powerfully supported by the photos. 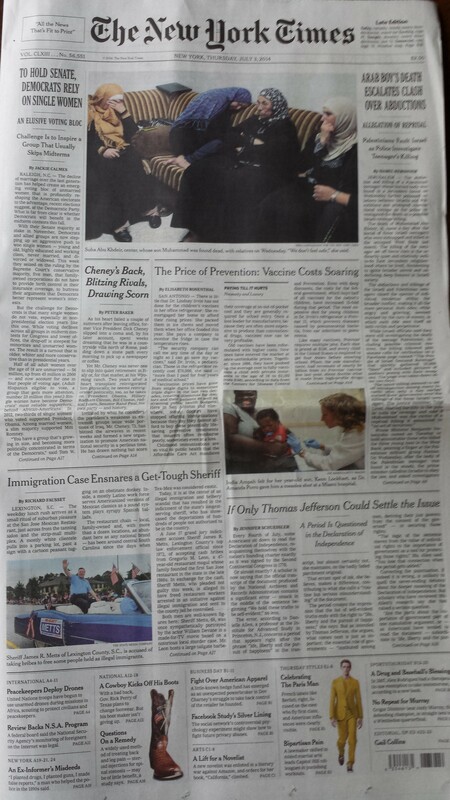 In fact, I thought the DIY-looking photos of the relevant NYT pages gave the story an added punch. It showed, plainly, how biased and emotionally twisted (and twisting) NYT coverage of Israel truly is.